Hi there! Today I’m reviewing the hair care products I’m using at the moment – Aussie Mega Shampoo & Conditioner. These 2 products contain kangaroo paw flower extract, and they promise to leave hair soft, shiny and full of bounce. Aussie Mega Shampoo is simply wonderful. It smells like paradise, and it feels amazing! It expands once it lathers up – this is awesome fun, and it also means that you only need to use a small amount of shampoo. If you’ve never tried this shampoo, you need to change that. I could kick myself for not trying it sooner! Aussie Mega Conditioner is very nice too. It detangles my hair well – not perfectly, but definitely well enough. However, what’s really important is that this conditioner delivers on its promises! It makes my hair soft, shiny, big and bouncy. This is truly impressive! I think Aussie did an amazing job with these 2 Mega products – which are in my all-time top 10! I love using them, and I’ll buy them again – soon! 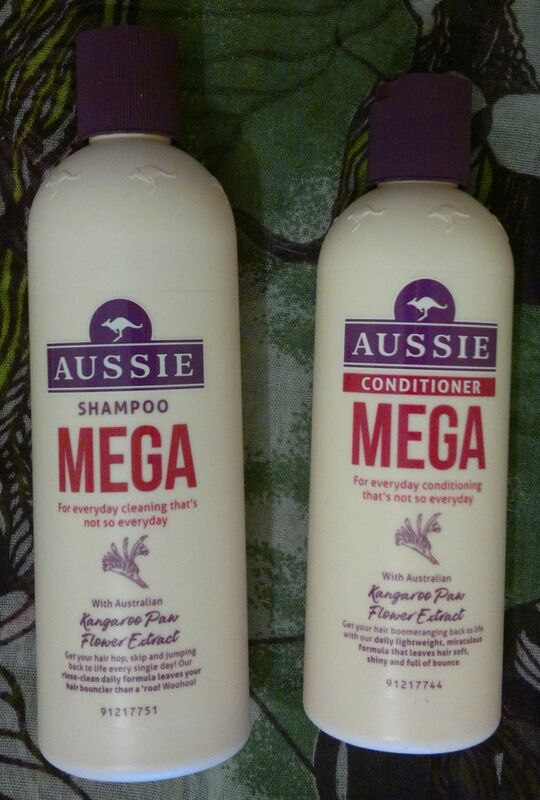 Aussie Mega Shampoo (300ml) & Conditioner (250ml) are available for £4.19 each. I paid £1.95 each (special offer). Hi there! Today’s post is about Gliss Hair Repair Total Repair Shampoo & Conditioner. Whilst this hair care combo has been around for ages, I never actually tried it. I guess I favoured the look of the other Gliss products because they’re more colourful. However, I’ve now tried the Total Repair hair products, and here’s what I think. Gliss Hair Repair Total Repair Shampoo is one of those shampoos that make hair feel super soft. The shampoo smells lovely (similar to all the other Gliss products), and I love that it doesn’t tangle up my hair. This is a great little shampoo! Gliss Hair Repair Total Repair Conditioner is very nice too. It makes my hair feel super silky, and a little goes a long way. Gliss did an amazing job with this conditioner. It’s definitely one of their best conditioners! I have noticed that my hair starts to get a little greasy if I use these products for more than 3 days in a row. So I am now using these products in a 2-1 rota. This means that I use these Gliss products for 2 consecutive days, then I use one of Alberto Balsam’s shampoo and conditioner combos for 1 day, then back to Gliss… and so on. This 2-1 rota works very well for my hair, and I love how my hair looks and feels. It’s a huge difference compared to the lifeless mess my hair was when I used Herbal Essences’ Cocoa products. 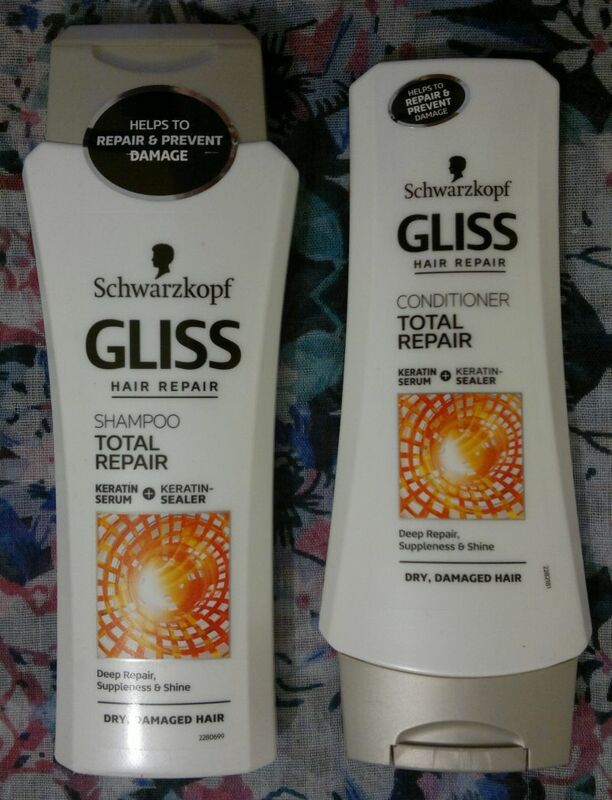 Gliss Hair Repair Total Repair Shampoo & Conditioner are available as 250ml and 200ml, respectively. They’re usually around £1 each, and they can be found in bargain stores such as Poundland, Poundstretcher, B&M Bargains and Home Bargains. I would recommend these products to those who want softer hair, and I think these products will make a difference for people with dry hair. I will definitely buy these products again! Hi there! 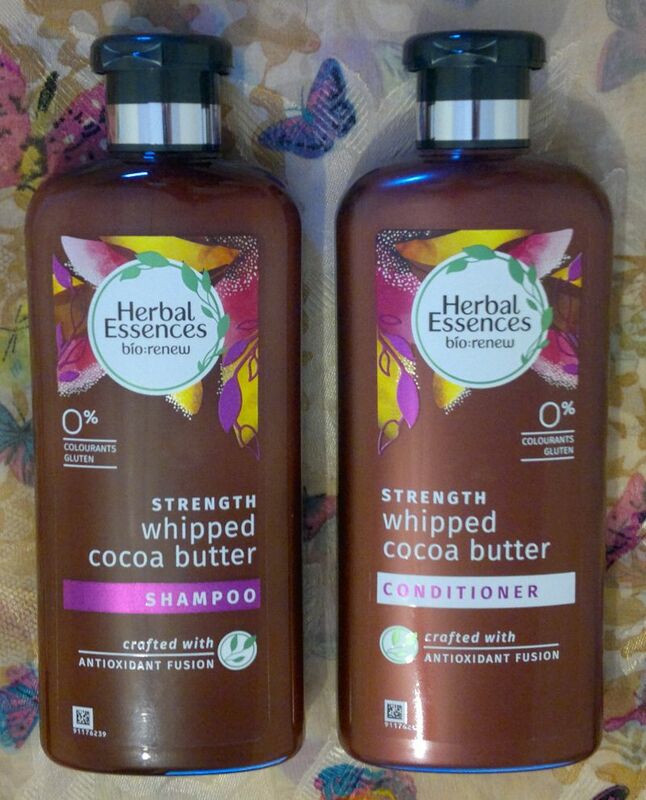 Today’s post is about Herbal Essences Bio Renew Whipped Cocoa Butter Strength Shampoo & Conditioner. It appears that these products are exclusive to Asda, which is where I picked them up when they were on special (2 for £5 offer). Onto the review! Herbal Essences Bio Renew Whipped Cocoa Butter Strength Conditioner is good, but not great. I love Herbal Essences’ original hair products, so I’m expecting this brand to be better than the competition. Whilst this conditioner helps me detangle my hair, and whilst it does make my hair feel soft, I do need quite a bit of product to achieve the desired result. The conditioner smells a bit “darker” than the shampoo. It smells like cocoa powder with a hint of incense. It’s not bad at all, but I really wanted a chocolate-scented hair care combo. Herbal Essences Bio Renew Whipped Cocoa Butter Strength Shampoo & Conditioner are available as 400ml for £4.50 each. I don’t think I’ll repurchase these 2 products, but I wouldn’t mind recommending them to people with normal hair. Hi there! Today’s post is about Pantene Pro-V Youth Protect Rejuvenating Intensive Conditioner which I picked up for £1 (Poundland). This conditioner promises to nourish hair for a more youthful look. The product is quick and easy to use – use it like any regular conditioner, but leave it on for 2 minutes. How’s the product? I like it! Whilst I think that Pantene’s Youth Protect shampoo and conditioner aren’t impressive at all, this intensive conditioner is very nice! I’m not sure about the “youthful” look, but I’m satisfied that this product makes my hair feel super soft. I like it! Pantene Pro-V Youth Protect Rejuvenating Intensive Conditioner is available as 200ml. I would definitely recommend it! Hi there! Today’s post is about 3 Wonder Woman branded products. These products were manufactured by H&A, a UK-based company that makes products for all sorts of different brands – they even made the Pusheen products I snapped up on Boxing Day! 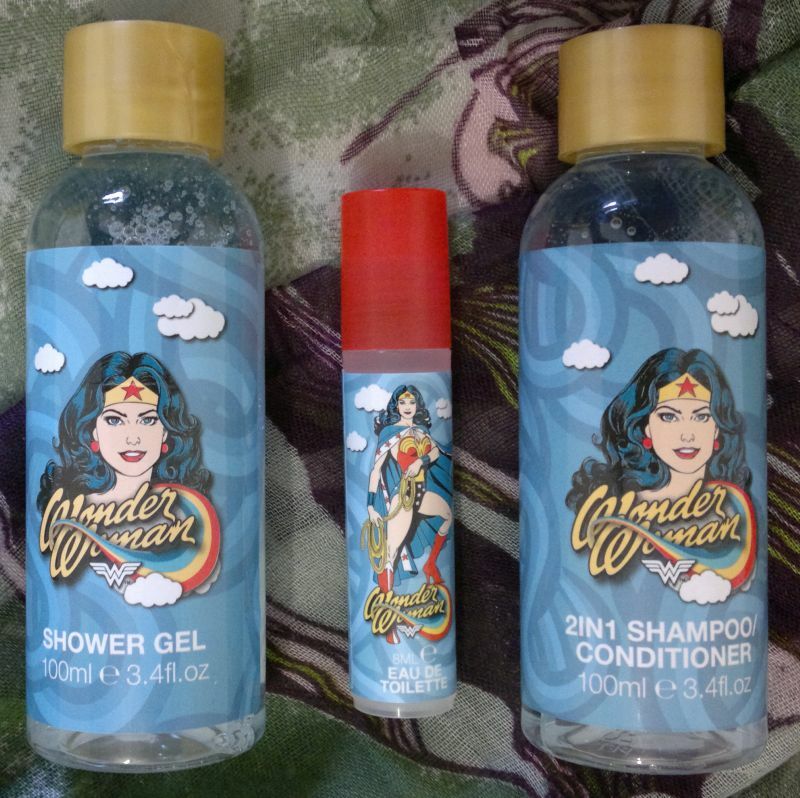 Moving on… here’s what I’m reviewing today – Wonder Woman Shower Gel, Wonder Woman 2in1 Shampoo & Conditioner, and Wonder Woman Roll-On Eau De Toilette. I’ve finally tried the shower gel as well. It has the same wonderful sweet rose and powder fragrance, and it doesn’t feel drying. I like it very much! Wonder Woman Shower Gel and 2in1 Shampoo & Conditioner are available as 100ml in a set. The Eau De Toilette is available as 8ml roll-on. I paid 50p each (clearance). 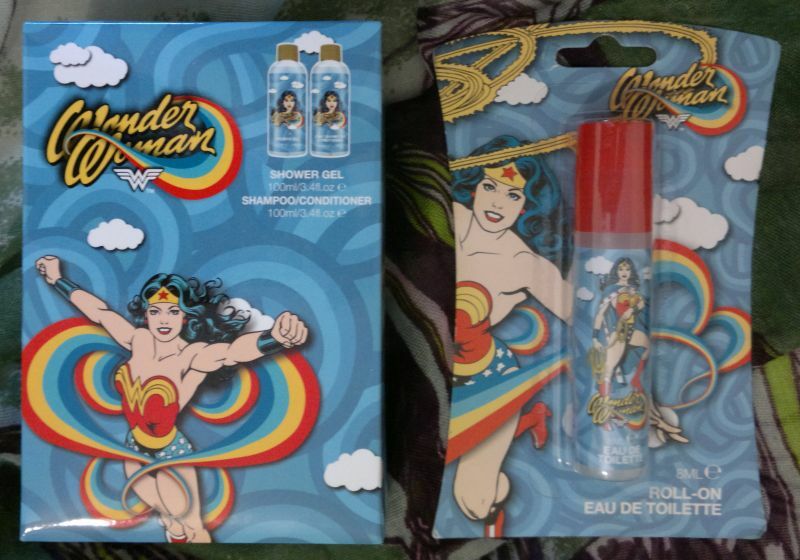 I’ve also seen a full-size Wonder Woman fragrance (same design, same manufacturer) for £14.99 at Superdrug. I think that was a 30ml bottle (but I’m not entirely sure). Daily Defense Pomegranate Moisturising Shampoo is very nice. It’s low in sulfate, but it lathers up perfectly, and it cleanses my hair gently. The fruity fragrance is a bit random, but I like the shampoo very much. Daily Defense Pomegranate Moisturising Conditioner is very effective. It detangles my hair with ease, it makes my hair feel soft and silky without weighing it down. Again, the random fruity fragrance is rather unspectacular, but in all other aspects this is a great conditioner which mops the floor with comparable products from brands like Pantene or Garnier. 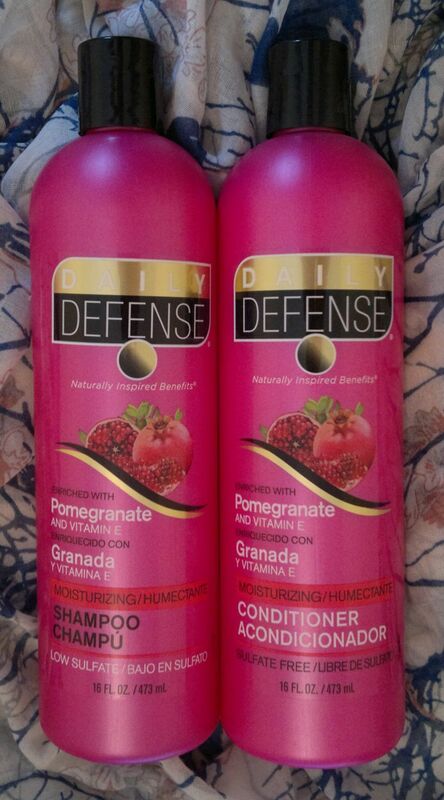 Daily Defense Pomegranate Moisturising Shampoo & Conditioner are available as 473ml each. I paid £1.25 each – a total steal!